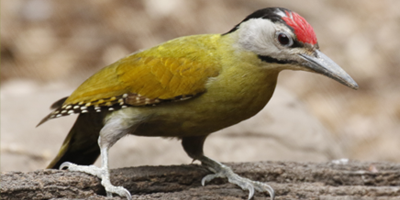 The grey-headed woodpecker can be easily recognized by its olive green upperparts. The males are even more noticeable because of their red crowns. This species prefers old mixed coniferous and oak forests with a high proportion of dead trees, because their nest is typically excavated into dead or severely damaged trees. The species is feeding on insects and seeds but mainly on ants, thus the species is connected to forests where ant hills can be found. The species can be found among others in the upper parts (12 ha) of Nagyoroszi project site (80 ha) of the DINPD. At this area we will maintain and create forest edges and small sunny glades (100-200 m 2 ) by cutting down certain shrubs and by liberating the crowns of certain trees to provide suitable conditions for ant hills. This area will be fenced to exclude the damaging effects of games on the regeneration capacity of the forest. Thus the structural and compositional diversity is expected to increase in the area. We will also create 30-40 m 3 per ha of standing and laying dead wood to provide suitable habitats for nesting and to increase the populations of food resources.